The villa is set within its own private grounds with a heated swimming pool at the rear. 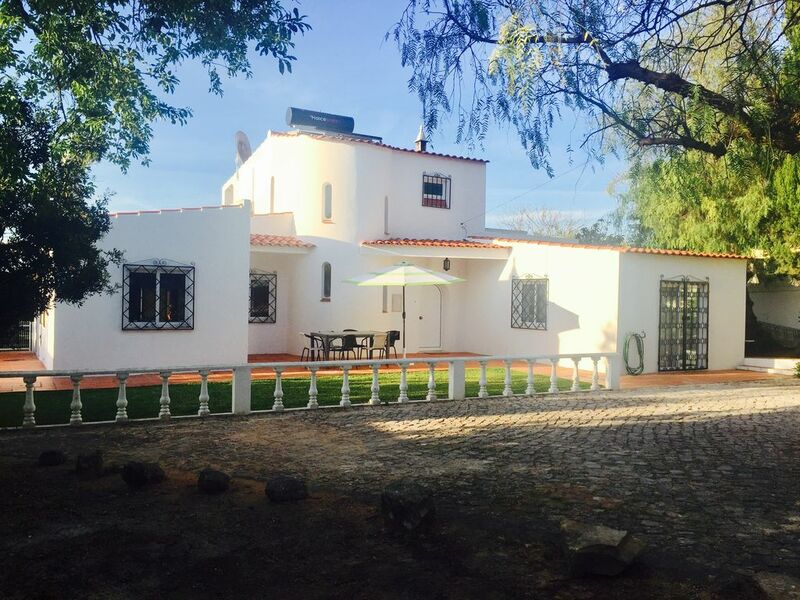 It is well located being approx 1km from Armacao de Pera with its long, golden beaches and with the motorway about 10 km away it opens up access to the Algarve coast, golf courses and waterslide parks (the closest Aqualand being about 3km) as well as Zoomarine 3km away. Armacao is a popular resort that has maintained it fishing village traditions and benefits from many good restaurants, bars and cafes. It also caters for holiday makers by providing tours to the local coves and caves, jet and water skiing, parascending etc. I had the villa built approximately 30 years ago and still enjoy my trips to the Algarve a few times a year. There have been a lot of changes in the local town (Armacao De Pera) and also at the villa. We've been able to constantly improve facilities (air-con, pool heating, solar panels, modern kitchen) whilst maintaining the good value and also the character of the villa. My 6 children now take their families out to the villa and the 19 grandchildren really enjoy the pool and gardens, as well as the fantastic beach nearby. I hope you will enjoy it one day too. It is close to Armacao de Pera - a vibrant town with good facilities and a lovely beach. The villa is out of town so it is very quiet and peaceful. Being 1/2hour from the airport you arrive at the villa without much hassle. The villa is secluded and private and it feels like a real escape. Fortunately its only a 1 mile to town and the shops, restaurants and beach. There are a lot of golf courses within a 1/2 hour drive so there is plenty to do - or not (if you want to laze by the heated pool). En-suite bathroom to the master bedroom on the first floor. Bathroom for bedrooms 2 and 3. Shower and wc to bedroom 4. Dining room with table leads to the living room, both with seating for 8 people. The living room has a marble fire place with log burner, 48" flatscreen TV, wireless speaker system(Bluetooth) is available and small collection of books, games and puzzles. Modern kitchen with cooker, hob, fridge/freezer, dishwasher, microwave, toaster. Bluetooth speakers in living area, simply pair your device. We have a number of U/PG videos available - we prefer to ensure that all resources are child-friendly. Large balcony overlooking the pool and extensive rural outlook to master bedroom. Court located just 0.5km away for hire. A few minutes walk from the villa is a tennis court available for hire for just a few euros. The nearest golf course is at Salgados, just 10 minutes drive away. Seasonal attractions: 'Zoomarine' - a sealife activity theme park, 'Aqualand' - splashpark, both just five minutes drive away. Take a drive to the Monchique mountain region, stopping at Silves castle along the way. There is also a rural nature reserve nearby, home to flamingoes and many more beautiful birds. Of course the choice along the coast of beaches and golf courses is vast, but there is so much on the doorstep, you can choose to explore or stay locally for your holiday. Notes on accommodation: Pool heating is optional and charged at £135 per week. Outside: The front garden is landscaped with a traditional Portuguese driveway that provides parking for several vehicles. There is a BBQ and alfresco marble dining area with an area laid to lawn. To the rear is a large private pool and garden and another poolside barbecue area with dining for 8 guests at a lovely rattan dining suite. There is an outside pool shower (cold only) and to the side is a washing line for guest use. Utility Room: Washing machine, iron, ironing board and sink, outdoor drying line available Cleaning / Towels / Linen / Maid service: A maid service is provided weekdays. Linen and bathroom towels are provided along with beach towels for your stay to save on luggage space. We have just returned home from our first stay at Casa Jaimie, Armacao de pera. We all absolutely loved it. To say we are all depressed now is an understatement. The villa, pool and gardens are immaculate and could not have been better. A perfect home from home. I really do not think we will holiday anywhere else now we have stayed there. We are already discussing our next visit! Thank you so much for your very kind words, we are delighted that you had such a good time and we hope that we can welcome you back to Casa Jaimie very soon! Best wishes to you all, Rebecca. The villa and pool made our holiday, it had everything you could possibly need and is in a perfect location. It’s about a 25 minute walk to the town and a supermarket but we did tend to get a taxi back as it was so hot, especially with a 5 year old. We ate out often as the restaurants were great and generally cater well for children. It was the best family holiday and we can’t wait to return. Thank you for taking the time to write these very kind words - we're absolutely delighted to hear that you had a wonderful time and hope that we can welcome you back to Casa Jaimie very soon - keep in touch! Best wishes, Rebecca. Thank you so much for an absolutely brilliant week at Casa Jaimie. The villa was spotless and brilliantly furnished (we were particularly impressed with the air con in the bedrooms) and the pool was an absolute winner with the kids. We tended to explore the beautiful local beaches in the morning and then relax by the pool in the afternoon - a perfect combo of activities for all of us. Thank you so much again! Thank you for your very kind words Zoe! We do hope that you are able to return to Casa Jaimie very soon! We had such a fantastic time at Casa Jaimie it was like a home from home. We instantly felt at home and relaxed and the kids loved the pool. Everything that we needed was there and more and we would definitely want to go back!! Brilliant Villa, brilliant location, Brilliant Holiday!!! Thank you. Thank you for your very kind feedback, we do hope that we can welcome you back to Casa Jaimie very soon! Comfortable relaxing holiday. Villa cleaned regularly. Very well equiped. It has a large pool with plenty relaxation space around it. Resort centre, beach and supermarket are a good 25 minute stroll away. We opted to hire a car which made shopping easier and helped us to see a few other areas. We did though walk to the centre in the evenings for dinner. No complaints about any of the restaurants. Watersports on the beach. We enjoyed a visit to Aqualand Waterpark and Silves is worth a look. We have have been back from our holiday for a few weeks and have really bad holiday blues. We went out as a family of 6 adults and 2 young children and have had an absolutely wonderful time. The villa was so much bigger then what it looks like in the pictures. The layout was great as we all had our own space and bathrooms. It was well maintained and fully equipped with anything you could possibly need (a home from home) the couple who look after the property were lovely and keep the place very clean and supplied us with clean linen and towels regularly. The local supermarket was great, it was in walking distance along with the beach and restaurants but as we had 2 young children to drag along in the heat, we decided to get a hire car for around €25 a day. This came in very handy as we ended up visiting other towns and beaches. It's worth taking a note of the direction given to you as the post code doesn't take you directly to the villa as it's up a private drive. We also managed to arrange to drop our luggage off at the villa before our check on time as our flight was very early, we just wondered into town for some lunch. Overall we had a fantastic holiday, great weather, great food, great beaches (very cold water) and great villa. We definitely would love to return again very soon. Thank you so much for your very kind review - we are delighted to know that you had a wonderful time and hope to welcome you back to Casa Jaimie very soon! The nearest beach is at the resort town of Armacao de Pera, a vast and beautiful beach with plenty of activities during Summer months - just 1.5 km from Casa Jaimie, just 15 minutes on foot or a few minutes by. A whole variety of beaches such as Gale, Salgados and Castelo are all within 10 minutes drive. Faro International Airport is approximately 35 minutes drive away, a car useful for a holiday at Casa Jaimie for exploring but by no means essential as Armacao de Pera is only 1.5km from the house, the route is pedestrian friendly and taxis are readily available in the town if required. Armacao De Pera 3 min drive. Aqualand Water Park 5 min drive. Vilamoura Marina 25 min drive. Silves Castle 20 min drive. Monchique Mountains 35 min drive. Booking Notes: 20% deposit on booking. Balance due 10 weeks before holiday. Prices are based on occupancy up to 4 guests, prices for up to 6 and up to 8 are included in your enquiry response. Additional guests over full occupancy of 8 will be charged on a person basis. Changeover Day: We try and remain flexible where possible regards changeover days, it's usually Saturday but we try and accommodate 'odd durations' so please do get in touch - we will always try and make your chosen dates work.